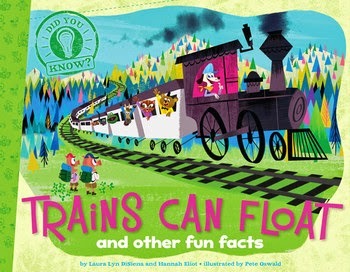 Trains Can Float is a book filled with cool fun facts about transport and vehicles. But it’s not just any book, it’s a simple, quirky journey through the facts and figures. The artwork throughout has an almost ‘Little Golden Book’ feel about it, which I found quite nostalgic. It feels both classic and contemporary, and comes with cute cartoon characters who demonstrate the various ways of getting around. Did you know … people have been riding in hot air balloons since the late 1700s, that about 9 million people ride the Tokyo subway every day, and that the Chengyang Bridge in China was built without using any nails?! That’s just a sneak peak at what you’ll discover in Trains Can Float. I learned quite a bit of useful trivia reading this book, so I’m sure children will too. You’ll probably need to be prepared for them asking that question, too: Did you know? And yes, trains can float, but not on water! You’ll need to read the book to find out just how they do float (or perhaps you already know).